Cousin Angela was our houseguest a couple of weeks ago. At 90+ she is the second most senior member of our extended family. She is a wonderful cook and a talented baker. Cousin Angela is no longer responsible for cooking for the family, but she loves to bake and still bakes up a storm! The lone zucchini plant in my vegetable garden is very productive. I harvest Zucchini every few days and enjoy sharing the surplus. In the days before and during Angela’s visit, I neglected the garden. The day we took her back home, we found an ENORMOUS Zucchini. We gave it to Cousin Angela, thinking their family of 6 could use it or (if it was inedible) they could add to their compost. We were invited to supper with her family a week later. 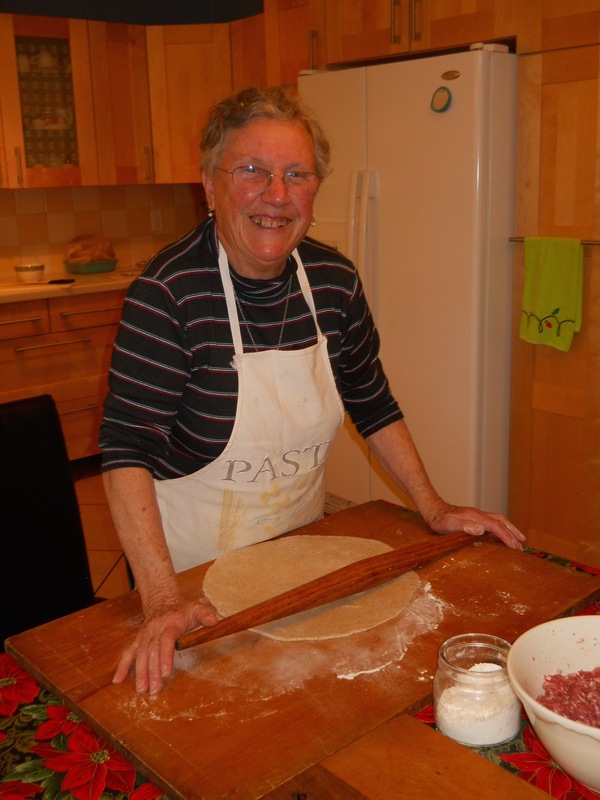 When we walked in, she greeted us with “You can call me Cousin Zucchi”, reached into the cookbook bookshelf and pulled out her “Over 100 Zucchini Squash Uses” cookbook. She had been baking with our zucchini all week! Zucchini Cookies…and they had fried some for sandwiches! So, the culinary stars aligned, Cousin Angela was the perfect recipient of our mutant Zucchini. Everything was delicious! We especially enjoyed the soft and moist Zucchini Cookies. With her permission, we share the recipe. We lost our dear mother this summer. Today is her 85th birthday. She was an early to bed and early to rise person and she made the most of the time in between. Our mother was a loving, energetic woman who lived her best life. We miss her every day. Buon Compleanno, Mamma. My sister Rose lives in Sicily. We visited her this summer. We usually spend our time in Sicily “In Famiglia.” We do a little sight seeing, reconnect with our extended family and relish Talking—Laughing—Cooking—Eating—-Together. Everybody in my family enjoys cooking. My father made hearty, traditional fare: wine, homemade sausage and garden vegetables on the grill. My mother bakes bread and makes delicious soups and frittatas. My sister Nina is the sucu (tomato sauce) specialist. I like to experiment with sweets and pastries and love making everything from scratch. We are all good cooks, but my sister Rose…she is the best. Rose’s food is familiar to us; we make the same general recipes but her version is, somehow, tastier. She uses the best ingredients, fresh fish, local olive oil and seasonal vegetables bought daily. But the quality of her cooking is not just about the raw materials. Her strength is her skill and touch with seasoning. Rose’s food is always perfectly seasoned. Not too much or too little salt, just the right amount. The herbs she uses are present but not overwhelming. The cheese is a perfect complement. She uses olive oil liberally but her food is not greasy. When we visit Rose, we don’t cook. We set the table, grate the cheese, slice the bread and wash the fruit. When Rose is cooking, we keep her company and share the time. My mother, my sister and I sit on the side of the table facing the stove and refrigerator and watch as she quickly and efficiently criss-crosses her kitchen for the right pan, bowl, ingredient and seasoning, happily and effortlessly turning out the most delicious food. We look forward to our traditional “first breakfast” when we visit Rose in Sicily. We get up, bleary eyed and jet lagged, sit at the table and wait while Rose makes an Ovu Frittu. A sunny side up egg accompanied by toasted crusty bread. She makes one at a time uses a small frying pan. 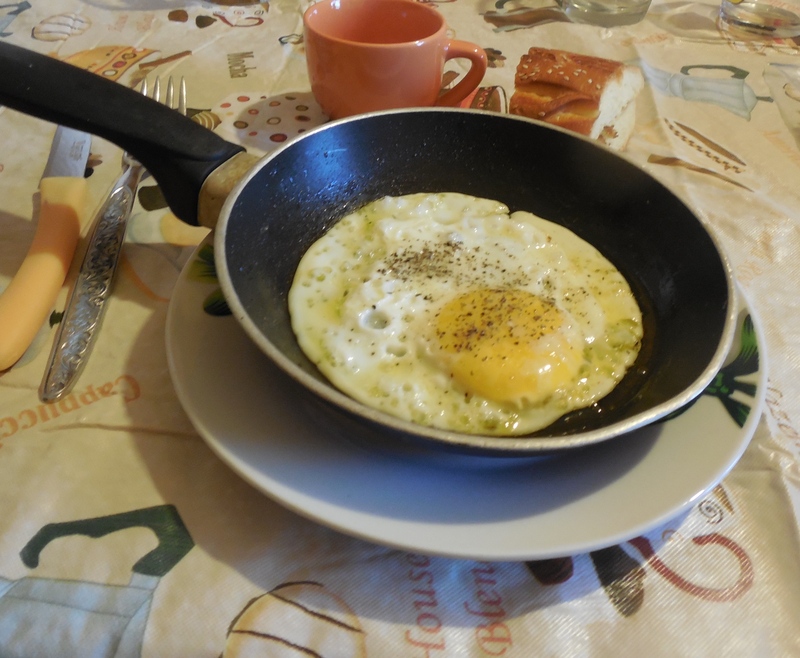 We wait our turn as our egg is cooked in olive oil, seasoned with salt and pepper and served in the skillet where it was cooked. The egg is perfection! It stays hot, the yolk thick but still liquid, the white firm but not rubbery. We dip our toast in the yolk, soak up olive oil and thoroughly enjoy our Ovu Frittu lovingly made by my sister Rose. It is blazingly hot today and doing something outside is not too appealing. What to do that’s fun, productive and delicious? 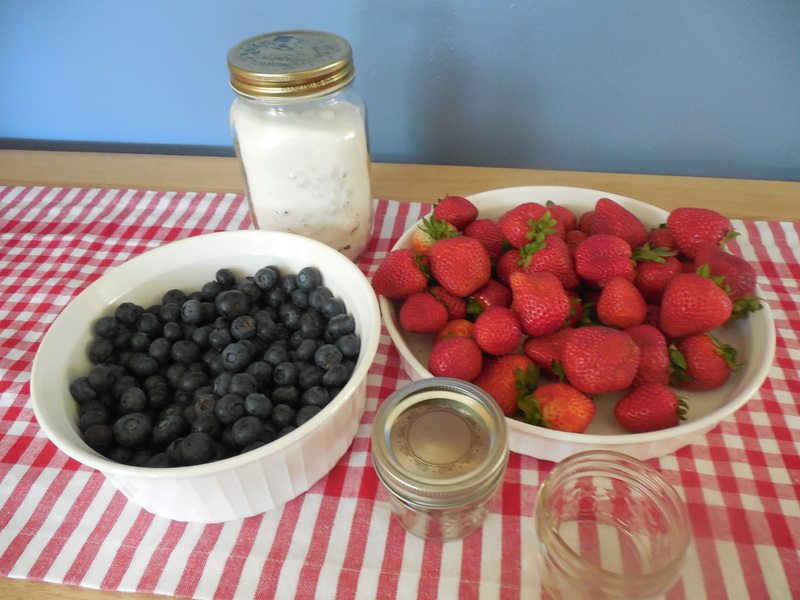 It really was easy, I had Strawberries, Blueberries, Sugar and Water on hand. The little jars were in the hall closet. All I needed to do was run to the grocery store for Sure Jell and I was ready to go. I use the lower sugar Sure Jell in the pink box and follow the instructions in the box. The hardest part of the task was standing at the stove stirring constantly for 10 minutes. I also have to make room in the freezer. 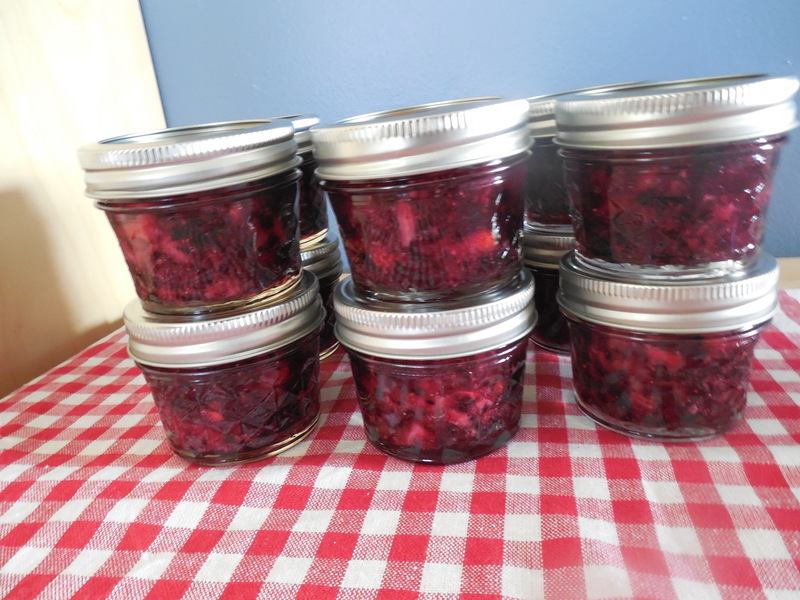 It was worth it, I love my little jars of jam! The first image is a picture of my father, Carmelo in his little hat. The little girl is his sister, Carmela but we called her Miluzza. On the lower left section of the picture is a foot and part of a leg. It is my favorite picture of my father. My grandmother sent the picture to my uncle Angelo in the US. And in turn it came to us after my uncle passed. At first I loved it because he was a very cute little boy, and it was hard to imagine my father as a small child. At some point we turned the picture over and noticed that my grandmother had written on the back. Just today while we were eating a photographer came by. Everyone on our street had their picture taken. Your father, had the pleasure of having a picture taken of Carmelino and Miluzza. Your father had to stand to the side because without your father, Carmilino did not want to stay there. The foot and leg in the picture belong to my father’s father…. The real reason we love this picture is because it is about our father, who was a loving and wonderful man, and about his father, who taught him well. We are blessed to have been raised by a long line of great fathers. We created a new garden bed and sowed some Cucuzza (Zucchini) seeds. They all germinated. The Zucchini plants are growing like crazy and today we picked the first of the crop! I have already written about Sicilian Cucuzza and I admit that it can be confusing. The Cucuzza in my previous blog is Cucuzza Di Rascari, which generally translates to “Cucuzza that is Scraped” this describes how we peel the Cucuzza. Cucuzza di Friiiri translates into “Cucuzza that is Fried,” which describes one of the preparations of the Zucchini. We never fry Cucuzza di Rascari we only stew or boil. Cucuzza di Friiri is a lot more versatile. At our house it is fried with or without breading, stewed as a side dish or pasta topping, roasted or baked as a vegetable and even made into a dessert. Today we stuffed and baked our garden Zucchini and made Zucchini Alla Genovese which means “In the Style of the City of Genova” which is not Sicilian but nonetheless a favorite at our house. It is a simple recipe, we always have the ingredients on hand and it is tasty both hot and at room temperature. Scoop out Zucchini pulp. Put cored Zucchini in a baking dish. Chop pulp finely. Place oil in a sauté plan over medium heat. Add garlic, Zucchini pulp and salt and pepper. Sauté about 3 minutes until Zucchini is cooked. Remove from heat and cool. Add breadcrumbs, oregano and cheese. Fill cored Zucchini with the stuffing mixture. Pour ½ cup water mixed with 1teaspoon olive oil into the bottom of the baking sheet. Bake 25 to 30 minutes until breadcrumbs begin to brown. In keeping with our Aragona tradition, we made our Taganu today. We are pleased with the result!